If one of the job descriptions below fits you or someone you know, please fill out our nomination form! According to the NCDP Plan of Organization (PDF), all county officers must be active, registered Democrats who reside in Craven County. Among the chair and three vice chair offices, one of these must be filled by a person of a racial or ethnic minority which constitutes at least 20% of the registered Democrats in that county and one of these offices must be filled by a person 36 years of age or younger. It’s also important to note that the job responsibilities of county officers aren’t limited to the descriptions below, because there’s a whole lot that goes on that isn’t covered by those descriptions. Some of the most important qualifications for any position at the county level are flexibility and a willingness to cooperate and get things done. As you’re considering whether you want to submit your name for any of these positions, please also consider the time commitment. The officers of the county party meet once per month, in addition to the regular county party gatherings and Executive Committee meetings. Especially in the months leading up to the 2020 election, the time commitment will grow as the county party becomes more active in get-out-the-vote and messaging efforts. If you’ve got something major in your plans for the 2020 election season — like long-term travel, a major medical operation, or running for office — a county party officer position might not be for you. But if you’re willing to work hard, be flexible, and commit to the job, you might be just what we’re looking for. See below for a description of the county officer positions you could run for. The Chair is the county party’s leader, who is responsible for setting out a vision for the county party and making it happen. Their job is to lead our county party — to lay out a strategic plan and work with the other officers and precinct and auxiliary leaders to see it through, and to represent us in public and in the district and state Democratic Party organizations. A good Chair candidate is an excellent leader and organizer, capable of inspiring people and delegating responsibility, flexible enough to lead the party through changing circumstances and expanding opportunities, excellent at coordinating a team of county officers. Transmit all records pertaining to the office to successor within ten (10) days of vacating office. The 1st Vice Chair is the Chair’s right-hand person, and is also responsible for precinct organization. Their job is to serve in the Chair’s stead when the Chair isn’t available, to identify leaders in unorganized and underorganized precincts, and help our precincts be as strong as they can be. A good 1st Vice Chair candidate is an excellent listener and people-person, capable of finding potentially strong leaders in our county and encouraging them to step up to the plate, a great team player to work alongside the Chair and the rest of the county officers, and flexible enough to cope with additional challenges as needed. The 2nd Vice Chair is responsible for training and education. Their job is to make sure that county officers, precinct leaders, and rank-and-file Democrats have all of the tools and training they need to effectively organize and mobilize. A good 2nd Vice Chair candidate is an excellent educator, capable of understanding where our party’s training needs are greatest and organizing a solution for those needs, able to bring in outside expertise to train party members when needed, and flexible enough to cope with changes in circumstances. The 3rd Vice Chair is the communications director for the county party. The 3rd Vice Chair will put together and implement an overall communications strategy that includes messaging, digital outreach (including this website and our social media), press outreach, design, and more. A good 3rd Vice Chair candidate is flexible, good at putting Democratic ideals into creative and engaging messaging, digitally savvy, and most importantly capable of putting together and delegating to a team to add specialist skills (design, copywriting, press outreach, etc.) that they may lack. The Secretary is the county party’s record-keeper and administrator. Secretary is an extremely important position, because they’re responsible for keeping our party’s history and institutional knowledge intact, for helping us learn from the experiences of the past and making sure all of the i’s are dotted and the t’s are crossed. A good Secretary candidate will be extremely detail-oriented, capable of flexibility and quick thinking on their feet, skilled with follow-through, and capable of organizing complex things. The Treasurer keeps us on a secure financial footing. The Treasurer makes sure that we’re following applicable state and federal laws with regard to our finances and donations, prepares an annual budget for Executive Committee approval, files all required financial reports with the state board of elections, and maintains our bank account and other financial holdings so that our Executive Committee can always be sure we’re on sound financial footing and we’re being good stewards of the contributions we’ve received. A good Treasurer candidate will be detail-oriented, accurate, and a stickler for the rules; willing to be trained to record, maintain and report required financial data using the State Board of Elections software in a timely and organized manner; and capable of generating clear financial reports for the other officers, the Executive Committee, and the party rank-and-file. The VoteBuilder Administrator is our chief data officer. Their job is especially critical for getting out the vote, as they’ll be the main person interfacing all of the data being collected by the DNC, NCDP, and county party with our boots-on-the-ground efforts at reaching out to voters with canvasses, phonebanks, and mail. A good VoteBuilder Administrator candidate is someone who already has experience with VoteBuilder or a similar CRM/big-data database, a good communicator and educator to put together and train a data team, and curious enough to find new ways to use one of the most important tools at our party’s disposal. Reach out to the NCDP data team to receive training on VoteBuilder administration, and remain up-to-date with the latest features and opportunities available on VoteBuilder. Coordinate with the Executive Officers and incoming 2019 precinct chairs to ensure that as many precincts as possible have a designated VoteBuilder representative and that precincts that are unorganized, underorganized, or otherwise lack a qualified VoteBuilder representative are provided for. Coordinate with the NCDP and with the CCDP 2nd Vice Chair to provide or facilitate basic and advanced VoteBuilder training for county officers and precinct VoteBuilder representatives, and administer the CCDP VoteBuilder Users email listserv and working group. Throughout the term in office, take primary responsibility for data collection for the CCDP, including keeping up-to-date email addresses for active members. Coordinate with the CCDP 3rd Vice Chair and precinct chairs to ensure that they are provided with the most recent and up-to-date email lists for their use in email campaigns. Coordinate with the CCDP Secretary and CCDP Treasurer (or whoever else is responsible) to ensure that VANIDs are linked to membership card numbers. During election cycles, take primary responsibility for the coordination and administration of CCDP VoteBuilder efforts, including coordinating with local, state, and national Democratic campaigns or Democratic organizations as needed, providing troubleshooting at the county level, generating lists or cutting turfs as necessary, facilitating data entry, and ensuring that proper targeting techniques are being used by precinct VoteBuilder representatives. Serve as the CCDP’s designated liaison with the NCDP Data Director and the NCDP data team, including membership on relevant NCDP Slack channels or other digital communications media, participation in webinars or in-person training opportunities, and serving as first-line technical support for VoteBuilder users at the county level with escalation to NCDP VoteBuilder experts as needed. Provide regular reports to the CCDP Executive Officers board and the CCDP Executive Committee as regards progress on the above responsibilities, and ensure that the Executive Officers and Executive Committee are kept up to date with what is needed from the county and precinct level for effective VoteBuilder administration. Unlike the NCDP-specified positions of chair, vice chairs, secretary, and treasurer, this position can be held concurrently with another officer position at the county level (i.e., the 2nd Vice Chair can also be the VoteBuilder Administrator). If this position is held by someone who is not already a county officer, the person holding this position will be an ex officio, nonvoting member of the county Executive Officers board. If this position is held by someone who is not already a member of the county Executive Committee in some other capacity, the person holding this position will be an ex officio, nonvoting member of the county Executive Committee. Please note that because this position and its job description have not yet been approved at the County Convention, they are subject to change or amendment at the convention. Those who are nominated for this position will be provided with the final job description, and the opportunity to withdraw their name from consideration, prior to any final vote at the County Convention. The Digital Infrastructure Administrator keeps our digital publicity and organizing tools in good, working order. They’re responsible for making sure our website is kept up and running, managing credentials for the many and various accounts and services we use, and maintaining the tools we use to communicate digitally within the party as well as to the larger public. A good Digital Infrastructure Administrator candidate has experience in digital services and administration (particularly website management), is very detail-oriented and organized, and is constantly looking for new ways to improve the party’s digital footprint and make our operations more effective via digital technology. Submit an annual outline of digital infrastructure expenditures to the CCDP Executive Board for inclusion in the annual CCDP budget, including but not limited to the cost of maintaining CCDP domain names, web hosting, and email service. Make recommendations as to how CCDP can reduce digital infrastructure costs or improve the efficiency and effectiveness of digital infrastructure by incorporating additional digital services. Maintain a listing of account usernames and passwords for CCDP digital properties, and work with the county party officers to ensure that everyone who needs access to those properties has them and that best practices for account security are maintained. 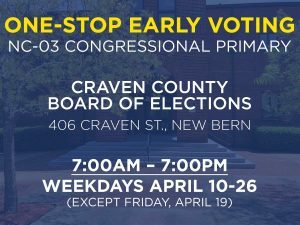 Be responsible for upkeep for the cravendemocrats.org digital presence, including software updates on the website and ensuring that the @cravendemocrats.org email forwarding addresses for county officers and precinct chairs are kept up to date. In coordination with the CCDP Secretary, maintain CCDP’s Google Group listservs and Google Drive repositories, including managing who should be on those listservs and have access to Google Drive, and ensuring that key Google Drive files (like the Executive Committee listing) are kept up-to-date. Provide regular reports to the CCDP Executive Officers board and the CCDP Executive Committee as regards progress on the above responsibilities, and ensure that the Executive Officers and Executive Committee are kept up to date with what is needed from the county and precinct level for effective digital infrastructure administration. Unlike the NCDP-specified positions of chair, vice chairs, secretary, and treasurer, this position can be held concurrently with another officer position at the county level (i.e., the 1st Vice Chair can also be the Digital Infrastructure Administrator). If this position is held by someone who is not already a county officer, the person holding this position will be an ex officio, nonvoting member of the county Executive Officers board. If this position is held by someone who is not already a member of the county Executive Committee in some other capacity, the person holding this position will be an ex officio, nonvoting member of the county Executive Committee.